Photo: Middleton Place, ca. 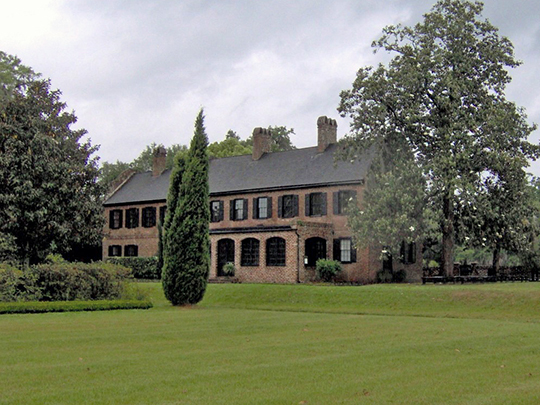 1730s, southeast of Summerville on U.S. Route 61, Dorchester County, SC. Plantation begun by John Williams, an early South Carolina planter. Listed on the National Register of Historic Places in 1971. Photographed by User: Brian Stansberry (own work), 2007, [cc-by-3.0 (creativecommons.org/licenses/by/3.0)], via Wikimedia Commons, accessed March, 2013. Dorchester County administrative offices are located at 201 Johnston Street, St. George, SC 29477; phone: 843-832-0103. Though Dorchester County was made up from parts of Colleton and Berkeley in 1897, its name and settlement go back to about 1697. As in the beginnings, agriculture, lumbering, and cattle raising are still the chief sources of livelihood for whites and blacks. Until recent years, the "Death Scroll" notified Dorchester folk of a funeral, as was done elsewhere in many places of the State. In ornate Spencerian chirography the facts were inscribed on a sheet of note paper ornamented with streamers of black ribbon, and the notice was sent through the community.